Performance Time: Approximately 45-60 minutes, 44 pgs. HOLIDAY. Abandoned by her family, Cleo the cat, hungry and cold, meets a beagle named Ralph who invites her in for a bit of food and a warm catnap. Even though Ralph is a self-professed cat hater, he soon takes a liking to Cleo and convinces his owner, Johnny, to adopt Cleo just in time for Christmas. 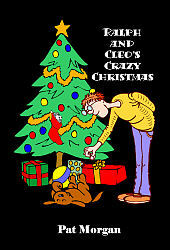 But Cleo’s luck runs out when a couple of dimwitted thieves petnap her and Ralph and hold them for ransom. Johnny must come up with the $2,000 ransom by Christmas Eve or Cleo and Ralph will be dropped off at a dog food company to be made into doggie treats! Award-winning playwright, Pat Morgan, has been writing plays since 1986. Ms. Morgan is a member of the Dramatist Guild of America, a founding member of Scriptwriters/Houston, and is Playwright in Residence at Pasadena Little Theater.